The cover story of the National Geographic magazine several months ago was cause for alarm. 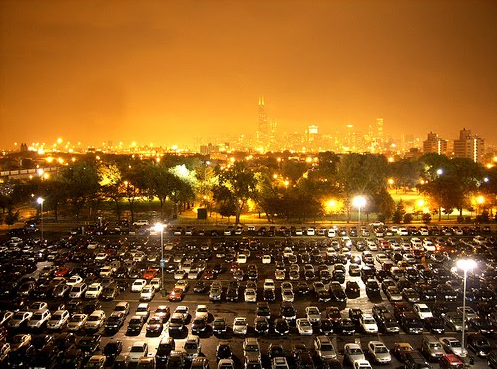 Not only does cit night light block our view from the stars and cause havoc with migrating birds, it affects humans as well. City lights that illuminate the night skies for miles on end are thought to be related to disrupting our circadian rhythms and the growing epidemic of insomnia across the country. Perhaps equally at fault is the amount of time spent in front of computer screens (be it laptops or smart phones). From the science of sleep we learn that as light (natural light, that is) diminishes and ambient temperatures drop, the sleep hormone, melatonin, increases in production and secretion producing drowsiness for a good night’s sleep. When light (and temperature) don’t decrease, this will affect the role of melatonin, and hence our quality of sleep. Melatonin is produced by the pineal gland, a pea sized part of the brain, located in the center of the head. For eons, the pineal gland (often called the third eye) has been associated with sleep. Although as of yet, no formal research has been done, there is speculation that abundant computer screen time in the night hours also throws off the delicate balance needed for the pineal gland to do it job properly. If you, like so many others have a hard time getting a good night’s sleep, consider making your bedroom as dark as possible. Also consider not using your computer 1-2 hours before bedtime (same with the cell phone). These and other factors (such as removing the TV from the bedroom, not using your smart phone to bed, etc. ), contribute to a good night’s sleep are collectively known as sleep hygiene, something we can all improve upon. While I was looking for images for this bog entry (a picture I took of the Milkyway was runner up) this photo off the web seemed to really drive home the point of night sky brightness. Brian Luke Seaward, Ph.D. is an internationally renowned expert in the fields of stress management, mind-body-spirit healing and stress and human spirituality. He is the author of over 10 books including the bestsellers, Stand Like Mountain, Flow Like Water, Stressed Is Desserts Spelled Backward, The Art of Calm, Quiet Mind, Fearless Heart and Managing Stress (6E). He can be reached through his website:www.brianlukeseaward.net. Did you ever hear about the numbers of policemen who contracted testicular cancer from the use of radar guns to catch speeders? It’s true. Radiation from these “guns” caused big problems. Years ago, Dr. Robert Becker came out with a landmark book called Cross Currents, where he espoused the dangers of power lines and their connection to cancer. Since the advent of cell phone technology many experts have noted the possible dangers of cell phone use with brain cancers and other health-related problems. While preliminary research was conducted by the cell phone companies with “no apparent danger,” new research suggests other wise. 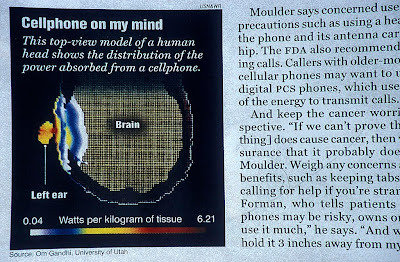 Here are the facts: Cell phones emit an ELF micro wave that is incompatible with the harmonics of human physiology. These micro waves destroy DNA, RNA and mitochondria. When this happens cancer isn’t far behind. Initial symptoms include headaches, insomnia and general fatigue. 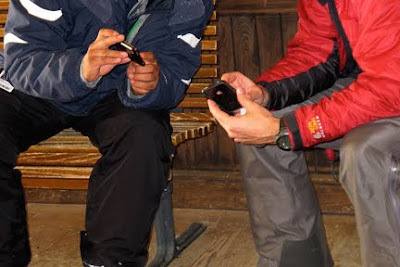 There is a HUGE experiment going on with cell phone use, and sadly there is no control group for this data collection. While cell phones surely promote convenience, the real question is at what cost? Specifically at what cost to your health. Cancer isn’t always deadly these days, when caught in time, but it is surely expensive. The biggest concer is the number of children who use cell phones. The human brain doesn’t completely form until age 25. One cannot ignore the danges of micro wave energies at close range to the human brain! If you have a cell phone, consider using it for emergencies only, not for prolong phone calls. Use your landline phone for all other calls. If you don’t have a landline, consider reinstalling one. Cordless phones are considered equally bad. Texting may be better than cell phone calls, but radiation is radiation. Do your best to minimize your exposure to cell phone radiation. Become educated on this matter (see links and book list below). “With the advent of our electrified modern life, we and all other living creatures on this planet are flooded in a sea of radiation never before encountered in our evolutional history.” —Devra Davis. 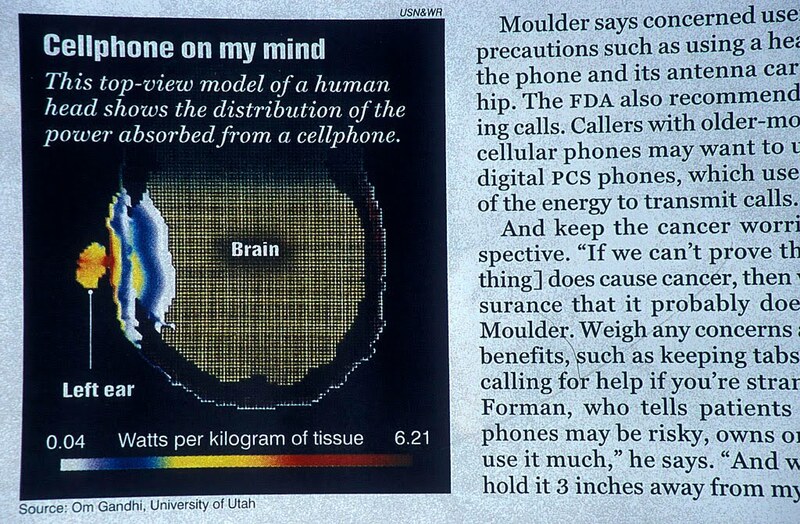 This photo scan is from an article in US News and World Report. 1,000 Things Went Right Today! It is very easy to dwell on the negative. The ego loves to find fault within and without. Negativism abounds everywhere in the form of complaining and whining these days. Perpetual negativism quickly becomes a label you wear on your forehead: I am a victim! Victim consciousness is rampant in our society, but for every complaint there is a bright side to look at. There is a silver lining to every grey cloud. Yes, there is much in the world that is positive, much in the world to celebrate! All it takes is looking at the world through a different pair of lenses. One of my colleagues, Ilan Shamir, has turned his advertising executive skills toward making the world a better place. One of his slogans is this “1,000 things went right today.” It is his effort to turn people’s attention away from the negative and focus on the positive. GREAT IDEA! Ilan’s idea is that nothing should be taken for granted, and he’s right. We have much to be grateful for, much to be appreciate of. Gratitude is a perception that is easy to adopt. Give it a try. Can you think of 1,000 things that went right today, or even yesterday? Can you thing of ten things that went right? Sure you can. Make a list— start with 10 things. Start with the obvious: breathing (some people cannot do this easily), walking with two legs, having three meals to eat, having a roof over your head. Add to this list things you ARE grateful for. It shouldn’t be hard. At the end of each day before you lay your head on the pillow, come up with ten more things that went right today. Take nothing for granted. Let this be the lens in which you choose to see the world. Ilan has started a company called Your True Nature. Here is a link to his site. I was in New England last weekend, clear up through yesterday speaking at several conferences. The weather was quite cold; 20 below zero a times (by comparison, I came home to temps in the high 50’s). 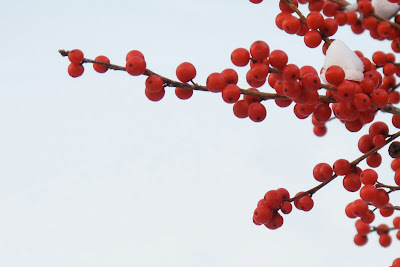 Despite the cold, I went out with my camera on day because I saw these beautiful red berries on a tree and just had to get a better look. Enjoy! Since seniors are texting and tweeting more and more there appears to be a need for a STC (Senior Texting Code). If you qualify for Senior Discounts this is the code for you. GGPBL ~ Gotta Go, Pacemaker Battery Low! IMHO ~ Is My Hearing-Aid On? OMSG ~ Oh My! Sorry – Gas! WAITT ~ Who Am I Talking To? WTP ~ Where’s The Prunes? Find something today that makes you laugh. Remember the quota of optimal laughs per days is 15, so once you find something funny, keep looking for the other 14. I found these guys texting at a ski resort on Seniors Day, perhaps some of the items from the list above? Ireland is a country rich in culture, history and music, yet there is a mystical essence that cannot be described in words. It must be felt in the heart through the landscape, the music, the stories and the land itself. It is this essence that we will capture on the Spirit of Ireland Journey. Not just a simple vacation to a pretty place, the theme of this journey is one of healing; healing the energetic ley lines (meridian points at various Celtic sacred sites, known as “faerie lines” in Ireland); helping to restore the healing energies of these sacred sites and offering compassion in action through daily meditations and reflections. We will visit and hold healing ceremonies at the Drombeg stone circle (County Cork) to the Poulnabrone Dolmen in the Burren region of County Clare and a great many sacred sites in between. We will also enjoy the beauty of the Irish culture and the spirit of Celtic traditions found in the music—LOTS of great music! 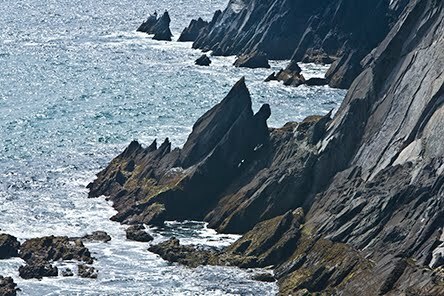 The southwest region of Ireland is renowned the world over for its stunning beauty and Celtic charm. People often say that traveling to Ireland is like stepping back in time to a land steeped in rich culture, history and spirituality; a less rushed lifestyle in a magical setting, where people meet you with a smile and a twinkle in their eye. Nearly everyone who went last year said this trip was a “life-changing” event in their lives and the friendships forged will last a lifetime. Who Should Come? Any and all people interested in a spiritual adventure to the Emerald Isle, specifically those who wish to travel with like-minded companions and healers interested in participating in a magical journey of Celtic spirituality, Celtic music and Celtic history. Our local tour guides are the best in Ireland and know exactly how to create the magical alchemy we desire for a most memorable experience. You don’t have to be of Irish heritage to enjoy this trip, but those who claim Irish ancestry will be smiling for years to come. Space is limited to 22 beautiful like-minded souls. May your life bring you gladness and always, God love you. 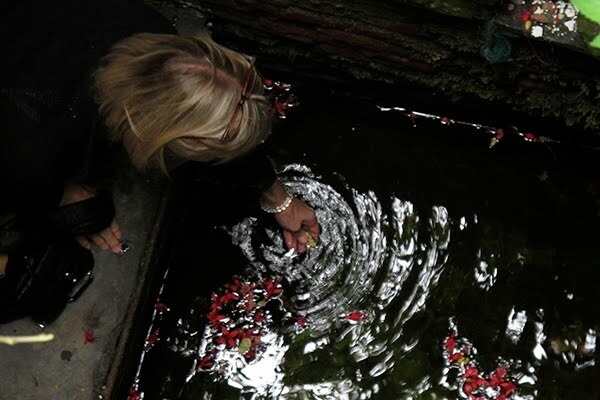 One stop on our tour is to St. Brigit’s Well, an earthen spring recognized with healing qualities of the spring waters that dates back over a thousand years. Celtic lore recognizes the sacred feminine, and St. Brigit symbolizes this, just one aspect of our healing journey. Have you noticed how easy it is to forget things these days? When the mind is overwhelmed with sensory stimulation (and these days, who’s isn’t?) short term memory is compromised, sometimes greatly! Simply stated, everybody, regardless of their age, seems to be having beaucoup “senior moments.” Experts suggest that technology doesn’t really help much with memory retention. People who use GPS devices often become too reliant on them for second and third trips to the same place, rather than committing the route to memory. Google, the bottomless pit of information, makes retrieval so easy that people often fail to remember what they looked up knowing they can return to look it up again. Spell check is has made everybody lazy spellers. And…anyone who has lost their cell phone call tell you the horrors of not committing phone numbers to memory. As it turns out, memory, particularly short-term memory, is one of the first casualties of stress. When the mind is focus on fight or flight, even at the unconscious level, this is where all one’s attention is really focused. Everything else is deemed useless. So, when you combine a stressed lifestyle with abundant use of technology, it would stand to reason that one’s memory can be greatly compromised. This in turn, can create more stress, and the cycle just keeps turning. Memory, more specifically, memorization, is just one facet of mental well-being: The ability to gather, process, recall and communication information. How is your memory these days? Is your youg life filled with senior moments? Time for some mental gymnastics! To keep a sharp mind, make it a point to work on your short term memory: Memorize people’s phone numbers. Memorize your credit card number. Memorize lyrics to a new song or a favorite poem. There are stories of people in survival situations who tapped into the power of memorization (e.g., mathematical problems, violin concertos, etc.) and credit this skill with saving their lives. The brain is the mind’s first organ of choice, so take good care of the grey matter between your ears, including avoiding toxins like Aspartame and MSG. Fish oils (Omega 3’s and 6’s) are really good for brain cells, too. And the latest research suggests that regular cardiovascular physical exercise is excellent, not only for physical health, but mental well-being as well; including improving memory. With another group trip to Ireland scheduled in June (16-26), Dan (our musical troubadour) and I are going to learn some new Irish ballads (and that will require some strong memorization skills, believe me!) In honor of this feat, today’s image is a photo of the rocks of Slea Head on the Dingle Peninsula, County Kerry, Ireland. Enjoy! Love your neighbor as yourself. Do unto others as you would have them do unto you. Treat others as you wish to be treated. Bestow compassion on all individuals. The Golden Rule is considered to be the “golden standard” of human behavior; a lofty ideal, but hardly unreachable. There was a time, not long ago, where The Golden Rule was taught to all people, from all countries, all religions, all languages; taught by parents, taught by preachers, taught by wisdom keepers. There are many people today, particularly young people, who have never even heard of The Golden Rule. Today the Golden Rule has been replaced with the slogans: “Every man for himself,” “He or she who shouts loudest is right” and “It’s all about me!” Enter the age of narcissism. In light of the recent shootings in Tucson, AZ last weekend, human behavior, particularly uncivil behavior, is finally being questioned in the media (well, in some corners of the media). One person to champion the practice of The Golden Rule is British Theologian, Karen Armstrong. Karen is a recent recipient of the TED award. Her goal: to create a charter of compassion. Her reason; to move the global community out of despair and narcissism toward compassion and community building. As young children, our hearts are open to a loving world. As we mature into adulthood, we learn to close our hearts as a means of protection. Yet, that which protects in the short term fosters selfish and narcissistic behavior in the long term. Simply stated, it is ego that derails any effort to practice The Golden Rule. The stress tip for today is to reopen your heart and domesticate the ego. To do this effectively, you must first ask yourself what thoughts, perceptions, attitudes and beliefs (right or wrong) have narrowed the passage of compassion that streams from your heart space. Practicing The Golden Rule means taking the high road with human behavior. It means treating others with respect. Everyone! The first step when taking the high road is opening your heart. Here are two links highlighting Karen Armstrong and her efforts to re-introduce The Golden Rule to Humanity. 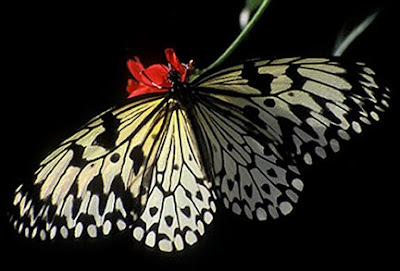 Today’s photograph, a butterfly, is a symbol of transformation, rising above mediocrity to our highest human potential. Food Energy: Is Your Food Really Dead? When you shop for food, do you shop primarily for convenience? How much of the food that you buy is processed foods, junk foods, comfort foods? How many meals do you “prepare” rather than nuke in a microwave? Perhaps the real question is: How dead is your food? How empty are the calories you are eating? These are important questions to ask yourself when you consider your own health habits. Tonight (and perhaps as often as you can) make a meal from scratch! Join the slow food movemen— from preparation to eating. Invest in your health! 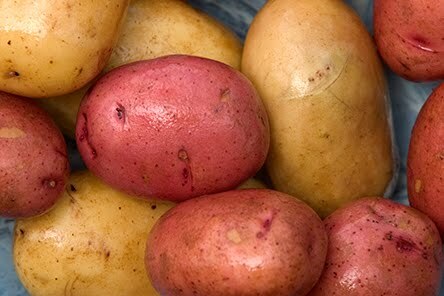 A photo of fresh potatoes. I learned years ago that potatoes are the number one veggie eaten in America… as French fries in fast food joints. There are so many other ways to enjoy potatoes. Give it a try! Step outside yourself for a moment and take a good look at yourself— as objectively as you can (try to see yourself as a stranger or colleague might see you upon). Are there things in your life that you are holding on to that have become deadweights around your neck? Are there things you are holding on to that in all honesty, are casualties of a bruised ego? Begin to make a list of things in your life that you are a little too closely associated with. It might be your house, a job, a financial decision, perhaps even a (toxic) relationship. Weigh the pros (gains) and cons (losses). Pick one aspect of your life and begin to lighten the load. Remember this sage advice: Nature abhors a vacuum. Whatever you let go of, will often be replaced by something of equal or greater value. And, as the expression goes, pain is inevitable, suffering is optional. I googled the expression ‘cutting your losses” and came up with a host of different links, including the following: If these might be of interest, take a peek. 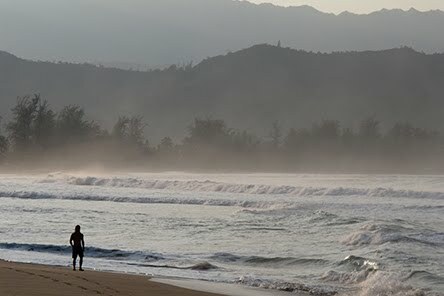 Today’s photo was taken a few weeks ago on Hanalei Bay, Kauai. Enjoy! It’s natural to want to make improvements, if not major corrections, in our lives. The climb for self-improvement to reach our highest potential is as old as time itself. Making changes is not always easy, however. It takes a strong idea coupled with desire, will power and foresight to see the desired outcome. Much of stress management falls in the domain of “behavior modification,” changing negative thoughts and behaviors into positive ones, which in turn, promote optimal health and wellbeing. The start of each year is ideal for making a course correction in our lives, but there are countless times to initiate positive behavior changes, such as the start of each month, the start of each week, even the start of each day. As the expression goes, “there is no time like the present.” Often, people who are ready for a change, want a complete life-makeover. Yet, changing many behaviors all at once can be a recipe for failure. Experts suggest making one change at a time until it becomes second nature. Then move on to and conquer the next goal. These days making positive healthy lifestyle changes also requires healthy boundaries and perhaps a frequent unplugging from cultural norms that do nothing to assist you in your efforts (e.g., television ads that use subtle unconscious messages to derail one’s best efforts). You can do it. Take a deep breath, and place one foot forward with your eye on the goal. Keep moving, even if it seems you are taking baby steps. This is how dreams are achieved. Eating habits, finances, sleep habits, technology habits and relationships; the directions for positive life changes are many, leading people to become overwhelmed quickly. So pick one, just one. Where do you feel like your life needs the biggest correction factor? Take a moment and then see yourself having accomplished the goal. Creative an image in your mind of how you wish to be; a new and improved you. As the expression goes, “As if becomes as is.” If need be, ask a few close friends to give you moral support. Remember, even if you feel like you are backsliding occasionally, this is all part of the process. Two steps forward…..
Having just watched the movie, The King’s Speech, I felt compelled to list it here as a recommendation, if nothing more, as a personal reminder that the quest for self-improvement isn’t always quick nor easy, but the intangible reward of success is the sweetest taste of life’s victory. I highly recommend this film. Best of luck with your goals and aspirations during the start of this auspicious year. 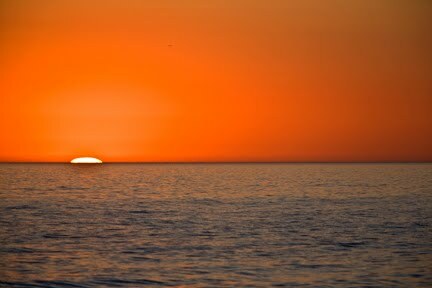 This photo was taken at sunrise in Florida on January 1, 2011, a nice reminder that each day is a new beginning, bringing us closer to our highest potential. Enjoy!